When Germany won the World Cup in 1954 in a match dubbed ‘The Miracle of Bern”, they were wearing adidas’ revolutionary customisable football boots. To mark the 50th anniversary of this triumphant conquest, adidas released the F50. Like it’s ancestor, the F50 was a revolution. 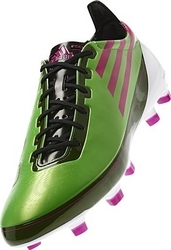 adidas F50 adizero in green and pink. Engineered to adapt to the individual player with a high level of customisability and pioneering design, the award winning F50 featured adidas Fusion Frame System technology, interchangeable lining, lacing and adidas’ signature interchangeable studs. Worn and endorsed by world class players such as Lionel Messi and Diego Forlan, the F50 was a world class boot. adidas’ latest release is no exception to the brand’s now legendary reputation. The F50 adizero comes following several revisions of the original F50, but this boot is lighter, faster, sleeker, and meaner. One of the adidas’ F50 adizero’s most distinguishing feature is its weight. Despite incorporating so many new, enhanced features, adidas have still managed to shave weight off the previous model. At just 165grams, its not only 20grams lighter than its closest rival -Nike’s latest revision of the Mercurial Vapor Superfly- the adizero is simply the lightest boot ever made. Above all, the F50 adizero is engineered for speed and precision, and with players such as Wales’ Gareth Bale – ranked among the ten fastest premier league players – and Spain’s David Villa – noted for his speed and clinical accuracy on the field – both set to wear the boot, there is no contesting that adidas football boots are carving a serious niche among the world’s best. With the F50 adizero, adidas have taken engineering to a new level; every detail of this boot has been considered and refined. Both thinner and lighter than it’s predecessor, this F50 adizero is completely impervious to water, meaning it doesn’t become heavier in rain, it has a new grain engineered onto the outer surface, giving the ball far superior grip and spin in both wet and dry conditions. adidas’ SprintSkin technology gives the boot a synthetic layer, which is designed mould to the player’s feet, for greater comfort and support while simultaneously reducing weight and enhancing speed and performance. The adizero’s asymmetric parallel lacing system is angled across the boot to give a greater and cleaner kicking surface while the new Taperlace system makes the boot thinner and flatter to minimise unnecessary fabric between the foot and the ball, improving the player’s sensitivity and response. And of course, the F50 adizero retains all of the original F50’s best features like its interchangeable studs, although like everything else, these have been modified and enhanced. The F50 adizero is available with firm or soft ground sole-plates. The firm ground sole-plate incorporates new Triaxon studs, strategically placed to provide enhanced directional grip and optimum pressure distribution while the soft ground sole-plate substitutes six removable aluminium studs at the toe and heel for perfect traction on soft ground surfaces. Both plates provide enhanced stability, a closer fit and increased support through a sleeker midfoot area.